Scientists from the University of Bristol have conducted experiments to accelerate degradation in keratinous tissues such as feathers, scales and hair in order to simulate the processes that occur over deep time as something becomes a fossil. Their findings demonstrate that previous claims showing the preservation of keratin protein in dinosaur fossils are likely to be false. Similarly, widely publicised claims of dinosaur blood in fossil bones were shown to likely represent an artefact of degraded organic matter rather than actual blood cells. The researchers undertook experimental treatments that either used microbes to decay tissues or subjected tissues to intense heat and pressure – a process known as maturation – in order to mimic the conditions a fossil experiences deep underground. Evan Saitta from the University of Bristol's School of Earth Science, led the research which has been published in the journal Palaios. He said: "Decay and mild maturation resulted in some intriguing textural differences in degradation patterns based on the type of keratin such as curling versus crimping of filaments when matured. "These results may show promise for identifying relatively recent archaeological keratin remains but when maturation conditions are increased to simulate conditions present during burial and fossilisation, the keratin degrades into a foul-smelling, water-soluble fluid that can dissolve or leach away from the fossil." In another experiment the vacuum conditions of an electron microscope appear to have produced folds, pits and blebs in a sample of degraded turkey skin, similar to those features previously suggested to represent dinosaur blood cells. The range of sizes and shapes of these experimental and fossil structures is evidence that they form through a non-biological process, as opposed to a biological process like the formation of cells. 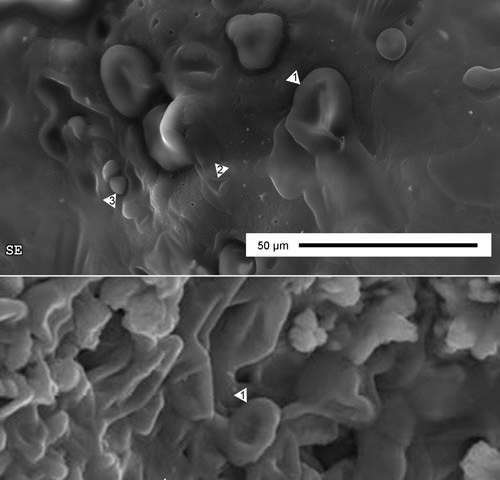 Thus, the purported blood cells in these dinosaur bones are likely to be degraded organics, most likely from microbes that invaded the cavities in the bone rather than exceptionally preserved, easily-degradable blood cells. Evan Saitta added: "We've shown that different keratin types show intriguing differences in degradation patterns that might help identify keratinous remains in archaeological material. "However, when the processes of fossilisation and burial over deep time are simulated, keratin protein fully degrades into a fluid that can be lost from fossils, meaning little utility for studying paleontological remains despite contrary claims."